3 APR 2019, BREMEN, Germany - Breakbulk Europe, the world's largest event for the project cargo and breakbulk industry, will return to Bremen, Germany, for the third consecutive year in 2020 at Messe Bremen from 26-28 May. 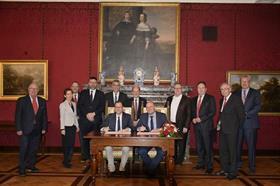 The official signing took place today at the Bremen Town Hall between Martin Gunthner, Minister of Economic Affairs, Labour and Ports of the Federal State of Bremen, Germany, and Nick Davison, Portfolio Director for Breakbulk Events, ITE Group. Joining the two cosigners were Hans Peter Schneider, CEO of M3B GmbH (Messe Bremen), representatives of the Bremen ports, logistics and breakbulk community and Michael Skiba, Head of Marketing at bremenports, the host port for Breakbulk Europe. "Breakbulk Europe returning to Bremen also in 2020 is great news for our location. Bremen 'breathes' trade and logistics, is one of the main breakbulk ports in Europe and therefore the logical choice as host of Breakbulk Europe," Gunthner said. "We are glad that we were able to convince ITE to come to Bremen for the third year in a row and to give us the chance to be a great host again for this wonderful show with more than 10.000 exhibitors and visitors." "Bremen can do ports and Bremen can do trade fairs. And that is why Bremen is the ideal partner city for ITE to host this outstanding event again in 2020," Robert Howe, Managing Director of bremenports, said. "I am both pleased and proud that we will have the opportunity to be good hosts to the international port business once again. On behalf of everyone at bremenports, 'Welcome to Breakbulk City!'" "We are delighted to be returning to the historic city of Bremen for the third year in a row," Davison said. "Bremen has really stepped up its commitment to provide the services to support this event. In fact, the city will provide free public transportation on its trams and trains to make traveling between the venue, hotels, restaurants and popular tourist sites around town convenient to all participants." Davison noted that the early announcement was made in consideration of all Breakbulk Europe attendees and especially the more than 550 companies that will exhibit at this year's event, 21-23 May. "As an organizer with more than 200 international events, we know it takes months of rigorous planning to make an event the size of Breakbulk Europe successful," Davison said. "Like with us, exhibiting companies also have much to plan as they prepare for this event. We wanted to share the location and dates for Breakbulk Europe 2020 as early as possible to help our current customers and those who wish to join us next year." 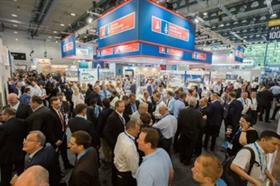 The 2020 announcement came during the runup to Breakbulk Europe 2019, which will be even bigger with more key networking opportunities for all. With the initial move to Bremen in 2018, attendance swelled by 26 percent?more than double the increase in 2017. Currently, visitor registration is 40 percent ahead of the same time last year. New to this year's event is the addition of Hall 7, which will feature the Masters Arena, a content theatre designed for the newly revamped VIP Shipper program, along with an exclusive Breakbulk Masters lounge located on the second level of this hall. General content offerings have been doubled with the Breakbulk Main Stage in Hall 4 and the Tech & Innovation Hub in Hall 6. The customer and visitor experience is always top priority, and improvements to this year's show are a direct response to feedback from attendees. There are more food venues and bars, including an open-air cafe at the front of the venue, flanked by large vehicle and equipment display space. A new registration area will be located in Hall 7 at the taxi drop-off, in addition to the registration area in Hall 4. Because of the unusual heat last year, the venue has improved the air conditioning system just in case the weather decides on a repeat performance. Further, long taxi queues will be a memory thanks to the city officials who have provided free public transportation to all Breakbulk attendees. Leading the event's sponsor roster is once again the Port of Bremen and its twin Port of Bremerhaven, managed by bremenports. Together they are an important logistics hub for the automotive industry, consolidating and distributing parts and kits for assembly lines all over the globe. Bremerhaven is also an important location for the offshore wind energy industry. Project cargo and breakbulk cargoes?large machinery, industrial plant components, steel and more?are primarily handled at the Port of Bremen. The bremenports stand will be located in the center of Hall 5 and will include 33 of its partner companies. Breakbulk Europe has become the global hub for the entire industrial project supply chain, including the world's foremost manufacturers, oil & gas companies, EPCs, carriers, ports, logistics firms, specialized transporters and related service providers. This year's event is expected to bring together around 11,000 professionals from more than 120 countries. To request exhibiting and sponsorship information and to register for the event, visit europe.breakbulk.com. We are one of the world's leading organisers of international trade exhibitions and conferences and specialise in organising events that help to connect your business to the world. We organise over 240 exhibitions and conferences each year worldwide with many market leading events and well known brands in key industry sectors.